Simple, classic, and kelly green!!! 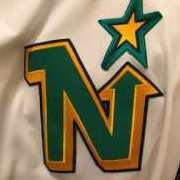 Also, the striping is based off the 1980s striping, but I tweaked it and added a grey stripe to the bottom white stripe (green on the away). The lone white stripe felt odd. Beautiful concept. The only thing I would change would be to remove the stripes off of the helmet. 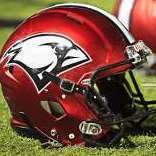 I feel like the helmet would look very cluttered with the wings and the stripes down the middle. Just a quick fix: helmet stripe removed. You did a good job putting this together but I feel like the overall look seems very outdated. Part of me really likes these uniforms. 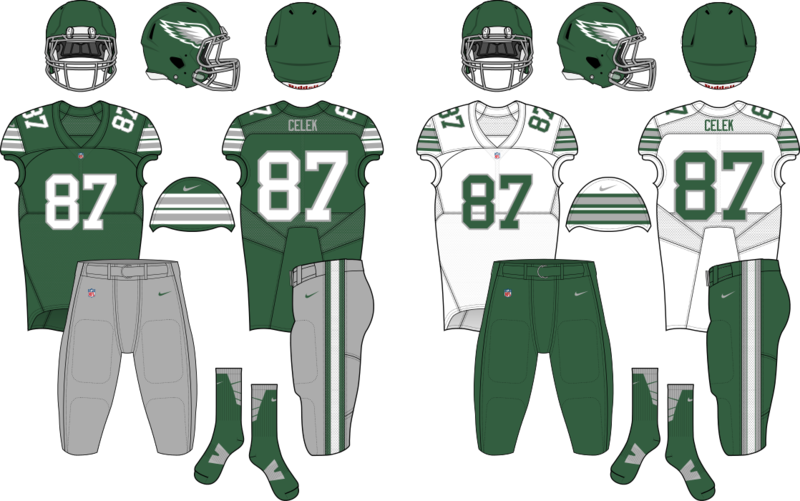 The other part of me thinks that it's just essentially the Buffalo Bills uniforms with a green and silver color scheme. Maybe change up the striping a little bit? Unless you plan on making a series of it and changing the Bills' uniforms. Beautiful. It's such a great color scheme. The Bills thing mentioned above does not bother me too much but I suppose a striping tweak would make sense for that reason.